After two episodes of the hard stuff (Part I & Part II), in Part III of our exploration of loudspeakers we go all touchy-feely with the soft fluffy stuff between our ears...sorry...inside our speakers. A driver with a thin untreated paper cone mounted on one face of an unlined cubic cabinet would honk like a migrating goose. The cumulative effect of the out-of-phase cone rear output reaching yours ears together with the driver's direct radiation is timing errors plus reinforcement and cancellation of certain frequencies in a series of peaks and troughs that are unharmonious. The cone rear radiation will have bounced through various combinations of flat unyielding reflective surface in the speaker cabinet. If this delayed and distorted signal re-enters the listening room, via the wafer thin cone material (lightweight untreated kevlar, paper or other fibres are not very opaque acoustically) or via a reflex port or via an unlined and undamped TQWP (tuned quarter-wave pipe), it would be like a daisy chain of low quality guitar effects units on random settings. In short the empty unlined loudspeaker box is a perfect device for the annihilation of music. The effect of these distorted reflections on music are many and horrible. The noisefloor of the system is raised, reducing its dynamic range and its ability to convey the very subtle nuances of a musical performance. The leading edges of transients multiply and ring making the sound seem unfocused. Low frequencies are phase-shifted more than the designated alignment would predict and thus rhythm and pace are affected. Some frequencies are reinforced and others are cancelled, the sum being comb-filtered. 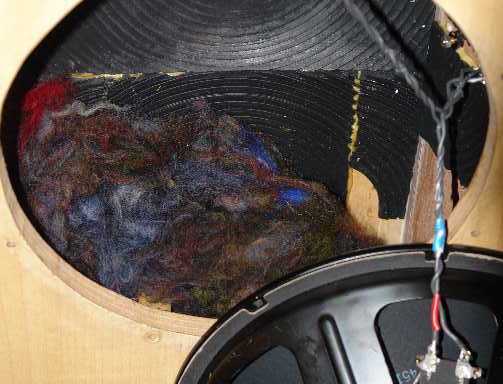 So it pays to take some measures to reduce these effects, and that usually means stuffing something in that speaker carcass. Many medical schools have ironic museums of the bizarre items removed from the bodily orifices of those unfortunate experimenters admitted to A&E (casualty departments or emergency rooms). 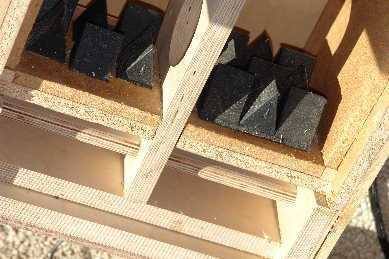 An extraordinary diversity of materials get inserted into loudspeaker boxes too. So loudspeaker builders have been inserting linings and stuffings in various measure with varying degrees of success for as long as loudspeaker literature exists, be it sales blurb, patents or academic papers. Thick felt, of the kind that used to be laid under carpets, was a popular choice in the early days of hifi. Glass fibre insulation material was irritatingly used for much of the '60s while Polyester or acrylic fibre (similar to that found in cheap sleeping-bags, duvets or pillows) gained popularity in the '70s, either inserted loose or stapled to the sides and back inner surfaces. Open cell foam and sculpted foam began to appear lining the walls of speakers in the '70s. An oversimplification might be useful to explain what effects different interior treatments have in loudspeakers. Sculpted foam, anechoic chamber type wedges, moulded panels or textured surfaces do a good job of scattering or reducing specular reflections at frequencies above the equivalent wavelength of 4x the depth of the treatment texture. I have read both theories in sales literature and loudspeaker articles and I suspect that neither hold the philosopher's stone. The problem is that it is very difficult to measure the effects of stuffing, and too much stuffing leads to as many problems as too little. The wrong stuffing choice for the bandwidth of the driver is equally worse than useless. A tiny midrange chamber like the old popular Peerless K040MRF fitted to such '70s designs as the IMF TLS80 benefits from very different stuffing material and density as that monster's bass transmission line loading a Kef B139. Whatever material is chosen to address any problem established by prototype testing, it must be used at the correct density, in the right place and held in place in the best way. It is better to avoid problems than have to patch over them, so cabinets with non-parallel sides are the best way to minimise standing waves. No amount of super effective stuffing will equal a box with a trapezoidal cross-section in any dimension, if your woodworking skills are up to it! However, if you do not mind a loudspeaker box whose external volume is greater than the minimum needed to obtain the correct internal volume for your chosen bass alignment there is a simple solution. Glue a few slanting internal planes into the enclosure to break up the facing parallel surfaces. Despite the obvious attraction of curves, spheres or cylinders are worse than oblongs because they have an identical dimension across two facing points over the whole internal surface. Stick a single board down the centre of a cylinder though, and it immediately loses that problem. Hence the popularity of semicylindrical loudspeakers in high-end circles. Thoughtful choice of bracing can also contribute to reduced standing waves and reflections and may also serve to support the minimum of stuffing. Unsupported masses of stuffing, of whatever material, can be made to move by the considerable pressure fluctuations in a bass cabinet, causing phase shifted pressure fluctuations reflected back to the cone (or non-linear port behaviour) which has the effect on music of seeming to drag the rhythm or disrupt the rhythm altogether. The higher Q of the bass alignment sounds impressive, particularly if a low Q (below maximally-flat aka critically damped Q=0.707) sealed box alignment existed before the modification. While it might be impressive with some material, it will be irritating with other material as plucked double bass waxes and wanes through a walking bass line for example. The uneven frequency response in the upper bass and lower midrange might also lead to one of those 'I never really heard that third vocalist in the background before' impressive moments, but only because the new response anomaly spotlighted that particular voice, but at the expense of something else. I do use surface treatments (including Deflex panels, wood beading laid side-by-side to diffuse reflections, rubber wedges like an anechoic chamber, and sculptured foam) combined with minimal stuffing. In asymmetric midrange enclosures I do find that surface treatment alone is often enough and that more than the minimum has negative effects. Larger midrange enclosures such as those on PA direct radiators do need a few pleats of acoustic wadding stapled to the sides, to prevent one-note honking. After trying the various polyester and acrylic fibre fillings offered as acoustic wadding, and comparing them to cheap polyester pillow stuffing and to fibreglass insulation wadding, and to long fibre wool in various densities I have been surprised to find how little difference I can hear, especially considering the hyperbole spouted on the Internet. There is far more difference between different densities and means of support of one material than between them, except perhaps long fibre wool. The latter seems to affect a wider bandwidth than many other alternatives and be more effective for a given volume. It does need very carefully teasing out to be effective. If it is unevenly teased into clumps of varying density they soon settle into an ineffective lump. Because of its capacity for teasing into a wide range of densities it is especially adaptable to any situation. This is very little stuffing because correct internal surface treatment and brace arrangement already combine to minimise standing waves. Without suitable internal cabinet surface treatments the minimum amount of stuffing needed to reduce coloured reflections coming through the cone or port would exceed the maximum amount of stuffing permissable before all the rhythm and life is stuffed from the music. There is a delicate line to be walked between overstuffed cabinets with a lifeless over damped sound and understuffed cabinets with timing errors caused by delayed information from the out-of-phase cone rear surface entering the listening room via the cone or port, plus timbre inaccuracy caused by emphasis of specific frequencies. 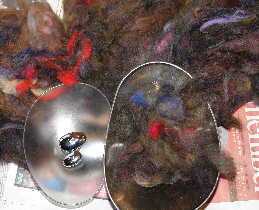 The wool should be teased out to minimum effective density, which is a surprisingly large volume for that small mass. However, tease it out too far and the wispy result fails to attenuate anything and rapidly collapses into a heap. In this 44 litre box 75% of the wool is supported by the central brace, where it has the most effect on standing waves, and 25% loosely above the bottom surface, raised about 70mm from the bottom inner face by rubber wedges like those found in anechoic chambers. So the effect of this layer of wool fibres will act between 70mm and 130mm rather than 60mm direct on the lower surface of the cabinet interior. Stuffing sealed boxes is rather less critical than reflex alignments because wider variations of each driver or box parameter are possible before noticeable and measurable alignment anomalies result. Hence the stuffing quantity tends to be less critical. It is still better on err on the side of too little rather than too much, and internal surface treatments are just as beneficial. As an experiment I played with stuffing types and amounts in a sealed 50litre box containing a MacKenzie 12" (30cm) bass guitar driver. The Q was calculated below 0.6 but the sound was lumpier than that figure would suggest. Eventually, after many trails of various fibres, and changing quantity and density the most notable result was how little the effect each change had, and all without success. The solution was a combination again. Sculpted foam on about 50% of the top, bottom and sides and a roll of long fibre wool attached to the back and held by plastic garden trellis. Even when cone treatment (to improve midrange performance in this 2 way 96dB system) raised the mass, and hence the Q, the bass remained fast and even. For years the owner enjoyed these with low powered valve (tube) amplifiers. These experiments are merely case studies, and the low numbers of speakers on which I have conducted stuffing trials do not constitute proper engineering evidence. However, the trials I have conducted with various loudspeaker projects since the '70s, have tended to confirm mainstream thinking and the publications of some of the most experienced experimenters and designers. So get stuffed...but not too stuffed. The best engineering solution is always the solution that achieves a good enough result with the minimum of materials and minimum complexity. Sadly none on the hifi at home due to building work on the music room.